This is how Kings Beach looked last week, in contrast to the wonderful clear expanse of beach I had practically to myself in this post. We have had some glorious days, and residents and holiday makers alike have made full use of the opportunity, although being more like loners ourselves, we tend to leave them to it, and prefer to frequent the beaches out of season! The harbour is in the background, and the tented roofs in the foreground are part of two beachfront restaurants overlooking the McArthur Baths, which are large public swimming pools right on the beach. We would like to wish everyone who has visited this blog a very HAPPY NEW YEAR, and look forward to showing you more of our great town in 2008. The London Missionary Society was granted the land, and set up a Chapel for these workers. They also allocated plots and rough houses were built on them. Many were beehive grass huts, others were wood and corrugated iron structures. In front of the Chapel was the graveyard which we featured yesterday, divided into Catholic, Wesleyan and London Missionary Society sections. The Park opposite our house, which has often featured in our photos, was at that time the graveyard for the Mfengu and Khoi San workers. There is a part of the suburb where, for 2 blocks, the houses are noticeably newer than the historic ones in the rest of the area. This is because in 1903 there was an outbreak of Bubonic Plague, which devastated this community. By this time, the Government had realised this was prime residential land close to all amenities, so the plague was used as an excuse to relocate the workers to Red location, so named because of the rusted corrugated iron used to build their homes. Over the next few days, after the New Year Theme Day, we will feature some pictures of all this, including the Chapel, a surviving corrugated Iron house, a fascinating photo taken in 1903 of the burning of Strangers Location during the Plague, and the award winning Red location Museum, with some of the original shacks and buildings. However today, we are showing you a fascinating old building, the Edward Street Synagogue, built on part of the land vacated by the removal of the location. It has distinct Art Nouveau details, but in a uniquely Israeli style. 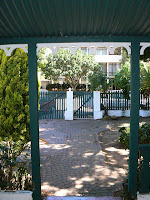 It was built for the Jewish tradesmen who moved into the area, but since the late 70s the Jewish population of Port Elizabeth has declined sharply, and this building is now used only rarely for services. It houses a Museum of Jewish History in PE, which we will also visit one of these days. We need help to choose which photo to use for the January 1st Theme day! Thanks so much to those who have already done so. If you have a chance, and haven't seen the choices yet, please go to the slideshow and let us know in the comments there which one you like best. Thanks! This morning we woke to a shroud of mist. This usually means that the day will be a scorcher (in fact we have been warned to expect a 3 day heat wave with temperatures going up to 35 degrees C!) so we took the opportunity for a stroll before it warmed up too much. This old graveyard on Russell road is one of our favourite spots, there always seem to be opportunities to get moody shots, and this morning was no exception. It has a fascinating history, if you want to read more, and see lots of pictures, both Max and I have done previous posts on it, and also on the St Mary's Graveyard in South End. Every year around Christmas, the kids wait with excitement for the fun fair to arrive and set up on the dunes at the edge of the Kings Beach car park. It used to be quite impressive, with roller coasters, a big wheel, wall of death and pirate ship which flipped right over, but as the years have gone by it seems to have gone into a decline. This year it was quite a sad and dismal sight to see the few scuffed and jaded "attractions" which were put up. One can't help but feel sorry for the owners as their livelihood disintegrates in front of their eyes. In the tent to the left are the dodgem cars. To the right of the picture is the water slide which is a permanent feature of Kings Beach. Please check out the post before this, we need your help to select our photo for January 1st Theme Day! We need your help! It is SOOOO hard trying to select our best photo for the 1st January Monthly theme. As this is quite a new blog, we didn't want to redo any of the ones we have already posted, so these are all new ones. We finally pinned it down to 12 (they are not the absolute best, because those were taken out of PE, but we decided to stick to PE photos for this challenge.) Please look through the slideshow, make a note of the name of the one you like best, and drop us a comment, we'd be so grateful for the help. 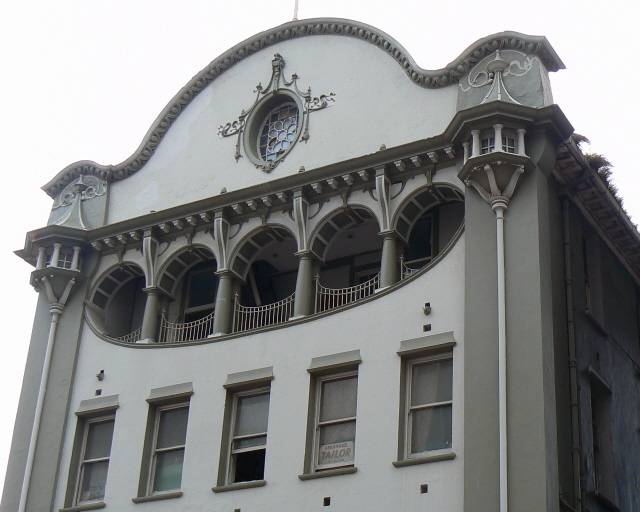 The gracious old Post Office building in Baakens Street, Port Elizabeth is one of our heritage buildings that is rapidly falling into disrepair through neglect. This is St Augustines Catholic Church, just off Market Square in the City Centre. It is built on a steep cliff face on the side of one of the streets leading up the Hill to Central. The foundation stone was laid in 1861, and the steeple completed and the church consecrated in 1866. It became a Cathedral in 1939. In 1897 Frances Livingstone Johnston, a pyromaniac, attempted to set it alight, but fortunately failed. She succeeded in burning two down other churches (which we will show you in coming weeks) and was arrested and sent to Robben Island, where she also set light to the Government offices while the officials were attending an evening party. 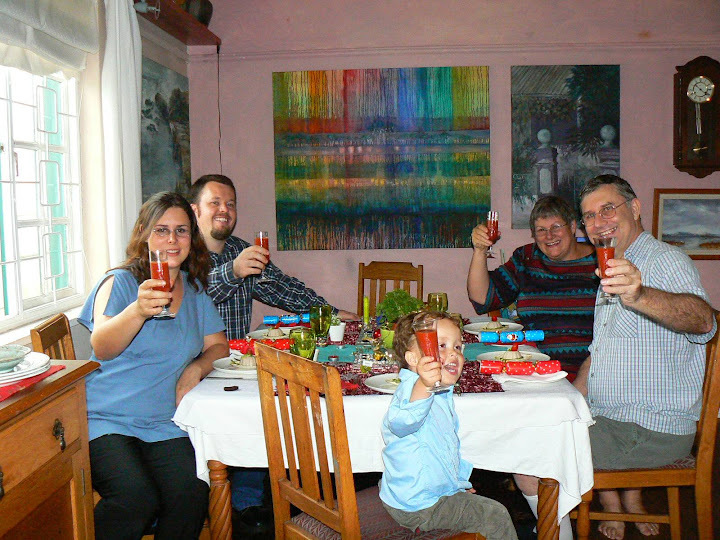 Wishing you and your loved ones a Very Happy Christmas from us and ours! I love this wonderfully maintained old building which is just round the corner from our house. It was a gracious mansion at one time, but is now used as offices. This kind of decorative detail always reminds me of cake icing! And this is the view we enjoyed as we ate. 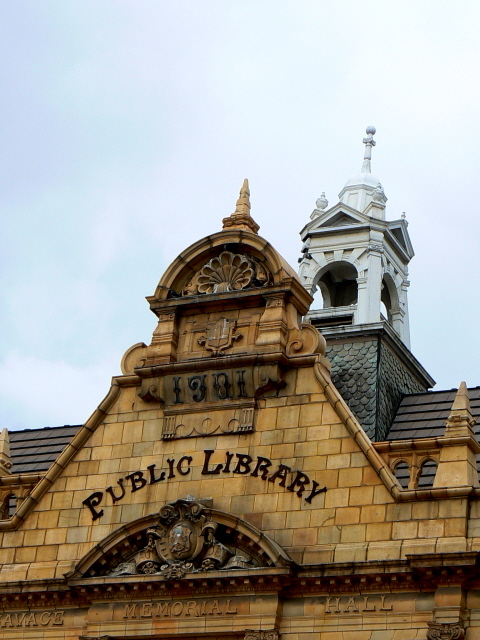 A gracious old building, completed in 1901, and home to a wonderful collection of historic books, documents and photos, dating back to the very beginning of the city's establishment. 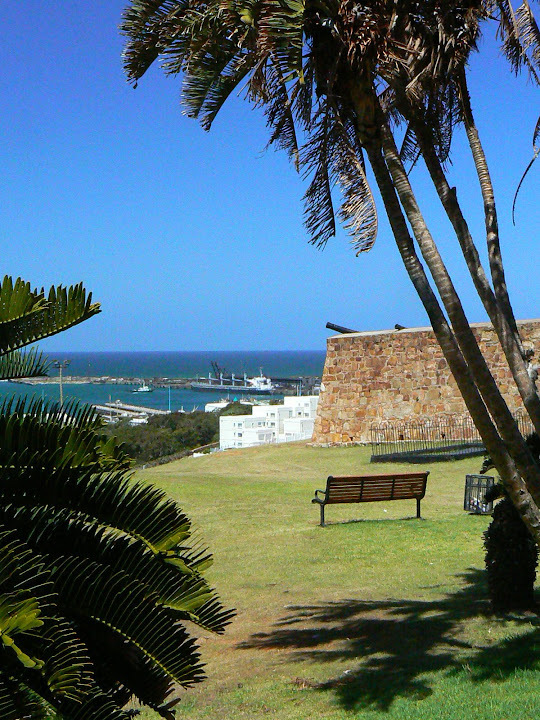 Fort Frederick is the oldest building in Port Elizabeth. It was put up in 1799 as a defense of the only safe anchorage on the South Eastern coast during the war against the French, and was garrisoned until 1862. However in all that time, a shot was never fired in anger from the canons which still peep over the walls. 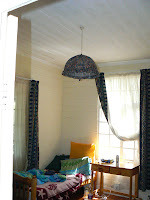 It has commanding views of the harbour and the Baakens Valley, looking across to South End. The grave which you can see behind the trees is that of Captain Francis Evatt, who died in 1850, after serving as Comandant of Fort Frederick for 34 years. He was in charge of the landing of the 1820 Settlers who, according to his headstone, were "treated by him with the greatest kindness and hospitality." YOUR SITE. I WAS BORN IN UITENHAGE AND LIVED IN PE UNTIL EARLY 20'S. 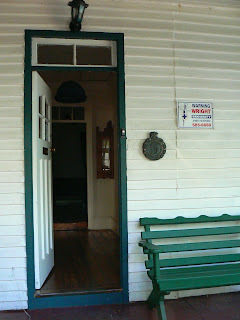 It is, indeed, a National Monument, here is the official plaque next to the front door. 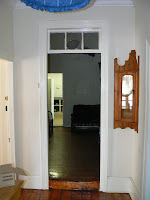 The property consists of two houses set in an L shape. 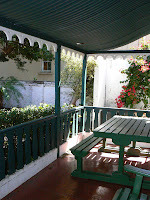 This is the patio of the one directly in front of the main gate from the street. 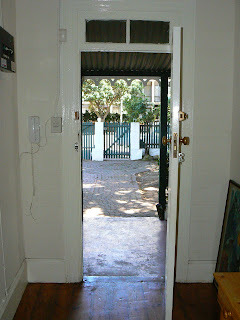 And looking out from the entrance hall towards the street. Less than a week to go, and the hustle and bustle leading up to Christmas is in full swing. Even little sidewalk cafes are getting in the mood.... this one is in Belmont Terrace near Fort Frederick, which we will show you soon. 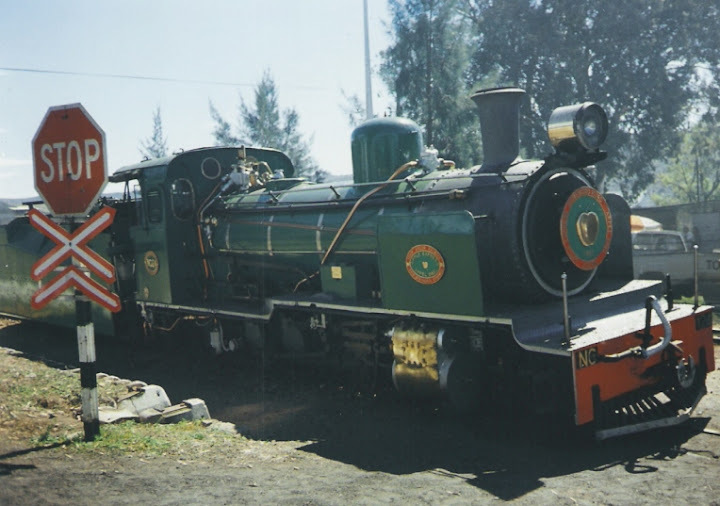 There are very few narrow guage steam trains still in operation around the world. One of them is the Apple Express, which runs from PE to Thornhill and back over weekends. It is a great trip giving one a leisurely view of the surroundling countryside, from a perspective you don't usually see. This picture of Granny Smith was taken at Loerie, during the Great Train Race several years back. It was a real fun event, where up to 600 teams of relay runners, raced the train to Loerie. Unfortunately the race fell foul of internal politics with Athletics South Africa and was subsequently derailed. Every year, on the Public Holiday we have in South Africa on 16th December, the City Council throws a party on the beachfront, complete with firework display. It is the official "Opening of the Season" to celebrate summer and welcome holiday visitors to our city. For the past 30 years that we have lived here, we have studiously avoided it, because of the crowds, parking and traffic issues etc. We sometimes went to high viewpoints and saw a bit of sparkle in the distance but that was it. Well this year, we decided it was our civic duty to go and record the event for you (LOL). And it was GREAT! We even enjoyed the crowds, the vibe, the kiddies oooh and aaaahs, and of course the wonderful fireworks. So guess where we will be on 16th December next year? For more pix, go to the MaX Files. This is a wonderful building, completed in 1865, with such intricate detail all over, that 1 photo would not have done it justice. So here is a montage to show it in its setting, on the brow of the hill overlooking the bay, and to show some of the craftsmanship in the details. 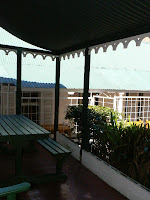 The delightful Cora Terrace, dating back to 1830 and the earliest terrace built in Port Elizabeth. The terrace is named after Cora Henderson, daughter of Henry Henderson who built it. He was murdered in 1834. 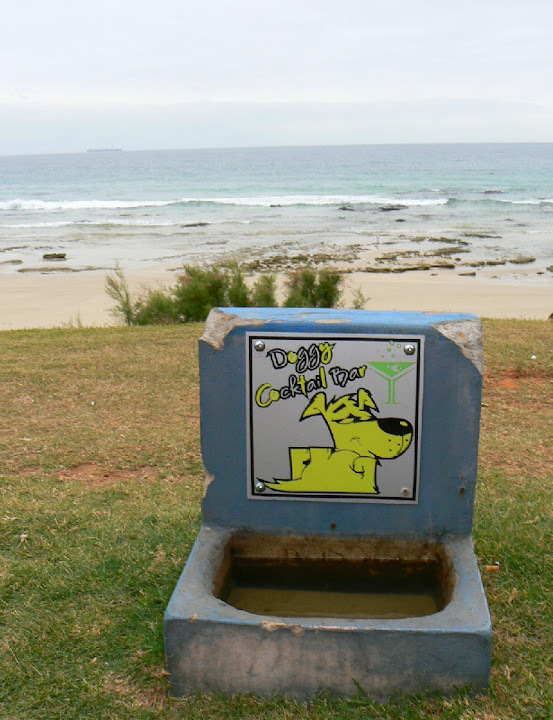 At the beachfront, even the canine tourists are well catered for. This was spotted on the edge of the beach, in front of a popular beachfront (human) watering hole! The marketing of Coca Cola never ceases to amaze me. They must truly be one of THE success stories worldwide. It has often amused us to be in some remote and backward little place in the middle of nowhere, and see Coke signs on the local store (often just a grass hut), in fact many years ago we used to make a point of photographing Coke signs in unlikey places. I had breakfast at the beachfront yesterday. It was a cloudy grey day, but the trusty all-pervasive Coke merchandise was there to add colour! One of the earliest schools for girls in PE was the Erica School, which started out in a couple of cottages next to the headmistress' home in Richmond Hill. This lovely building was opened in 1903, on the edge of Richmond Park, with commanding views over the bay. The school eventually outgrew it and moved on, and the building is now used for the art department of one of our colleges offering Tertiary education. I mean that is quite an achievement for a town whose nickname was, until recently, the ghost on the coast! but in the late 70s many of the motor manufacturers and parts manufactures relocated, and the city went through a terrible economic depression. When we came here to live, in 1978, there were empty places to rent all over, and we could really take our pick and name our terms, owners were just too glad to find a tennant. A real atmosphere of gloom pervaded the place, and the negativity became a well known feature of the city. Any business venture which was suggested would be knocked on the head with a comment like...oh it will never work in PE. .. It is still a feature of the PE psyche that, while the upwardly mobile in other cities brag about how MUCH something cost them, PE people will brag about what a BARGAIN they got!! Things like art, and services like design consulting sell for much less here than they do in the rest of the country.... because people here will just not pay what they consider to be inflated prices for luxury goods. Even property prices have only recently soared to catch up with those in the rest of the country. So against this background, the Municipality has done an amazing job of turning things around, bringing new initiatives, creating jobs, and instilling a new sense of pride in the city... the award is well deserved. Anyway this is meant to be a photo blog, and a newspaper article hardly qualifies, so here is a shot of the wonderful award winning Red Location Musuem, mentioned in the article. It is a really amazing place, and we will show more of it in the future, but if you want to know more about it, I did a post with lots of photos on my blog here. (the photos are small to save on my uploading allowance, which is rapidly running out on that blog, but you can click on them to enlarge). This photo shows the main lobby of the museum. The red cloth contains signatures of all involved in the project and community members. To the right, the row of pillars has biographies and pictures of the 'heroes of the struggle' for freedom from apartheid. 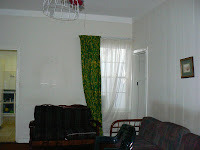 To the left of the cloth, not seen here, is the Nelson Mandela Room, containing his biography in photos and documents, including some of his letters to his family, written while he was in prison on Robben Island. This is a friendly little pub round the corner from us in Richmond Hill, where the locals hang out, watch sport and generally talk rubbish.... in other words like many pubs the world over! It serves good meals at really affordable prices, and for those of us who don't enjoy hanging out in other people's recycled cigarette smoke, the bonus is that everything on the menu is also available as take aways. Last week I briefly mentioned South End in Port Elizabeth, when I showed the ruin of the old St Peters Church. It used to be a thriving racially mixed community, with blacks, whites, coloureds, Indians and Chinese all living harmoniously together. Muslims, Christians and Hindus all had their places of worship near each other, and there was a great sense of community about the place. That is, until the Apartheid travesty of the Group Areas Act was passed, and in the '60s and '70s, the area was cleared out and bulldozed to the ground, and the people forcibly removed to racially segregated areas way across town. Because mosques are considered Holy Ground, the authorities agreed not to demolish them, and so this is the Pier street mosque, now standing lonely and isolated on the foreshore in the harbour area, separated from the former South End by the freeway that now runs along the shore to Humewood. It is seen here at sunrise, and we were up on the hill at South End overlooking the Harbour. If you want to read more, I did a post on this and also some background to yesterday's beach shot, when I went looking for dolpins HERE. This is the main swimming beach on the P.E. beachfront. As you can see it was very low tide, and I was lucky enough to be there out of season, and just about had the place to myself! Here we are looking towards the harbour. Shark Rock Pier, early morning last winter, chilly but worth it! Standing on the pier looking out across the sea, the sun struggling to break through the mist. Turning to look the other way, and we see part of the beachfront, with the remains of the mist hovering over it. The red roofs are from the Courtyard Hotel. Water droplets from the moist air have gathered on the wooden railings of the Pier. A magical morning, followed by a hearty breakfast in a nearby restaurant overlooking the sea. 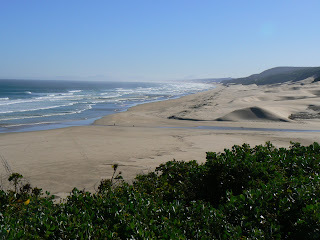 This is the Maitlands River Mouth, one of our favourite scenic and fishing spots on the outskirts of town. It features an enormous sand dune, which is cool for sand-boarding. The main water supply pipeline from the Churchill Dam crosses the river at this point. The river mouth is often closed by sand bars, which creates a lagoon until the next storm opens the mouth and the river again drains out in the sea. As we stand here looking at this view, we are facing West towards Capetown, with mile upon mile of pristine white beaches stretching out ahead. Behind us, to the east is a rocky coastline leading to the little coastal village of Schoenmakerskop. A hiking track leads there, known as the Sacramento trail. But on a calm warm day, there must be few nicer places on the planet! Yesterday it was Art Deco, today Art Nouveau.... this is one of the old original buildings in Main Street, where the city first developed. It is now called Govan Mbeki Avenue, after our current President's father. There are still a few of these gems, surrounded by some rather nasty high rises built after the middle of last Century. (It still feels weird to think of the years I was born and growing up as 'the middle of LAST Century', makes one feel positively geriatric! Ok, you are getting a bonus post today because I have been experimenting with altering the picture size, and YAY YIPPEE YAY, thanks to much help from Fenix of Bostonscapes, (who apparently also never sleeps!) it works! So treat this as a sort of TV test pattern......... THANKS FENIX!!!! This lovely old Art Deco building in Central is one of the few old and interesting ones which has not been allowed to fall into disrepair by uncaring landlords, who own many of the wonderful historic buildings in the area. The ones on either side of this are in a shocking state. In fact the one down the hill had a fire started by the vagrants who inhabit many of these buildings, and use the floorboards for firewood. It is now a burnt out out shell. Last Sunday, a storm blew over. I was trying to capture the lightning, which is unusual in PE, where our rain tends to be of the drizzly cold variety rather than heavy and tropical, but kept missing it. So much for quietly sitting on a park bench contemplating the peace and quiet......let's hope for a normal peaceful summer's day today! Taken from Central, looking towards Richmond Hill, with the old historic settlers graveyard to the right, and below the church whose steeple you see here. Many of these are the original buildings from the late 1800s. This was one of the earlier parts developed when the city was established. The road running downhill, left to right is known as Russell Road, after the then Governor of the Cape Colony, Lord Russell. It was formerly a steep river valley with cliffs along part of it, called Hyman's Kloof after one of the settlers who landed here in 1820. The pools along the river were a favourite place for truant schoolboys to hide out in the mid 1800s. The land that some of these buildings stand on was sold off to raise funds for the construction of the road.